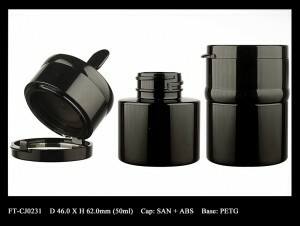 Cosmetic Cream Jar Features a Top Compartment – Cosmetics Packaging Supplier | Fancy & Trend Enterprise Co., Ltd. The multifunctional packaging design introduced by Fancy & Trend is a cosmetic cream jar has a spatula within for product application, and a top compartment to hold another product. 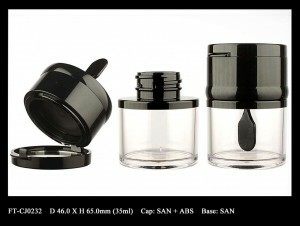 There are two different size available in 35ml and 50ml. Its top compartment has optional lid design that can be solid colored plastic, or a clear window. The component is made of PETG that makes it a compatible and safe container for various chemicals and ingredients.